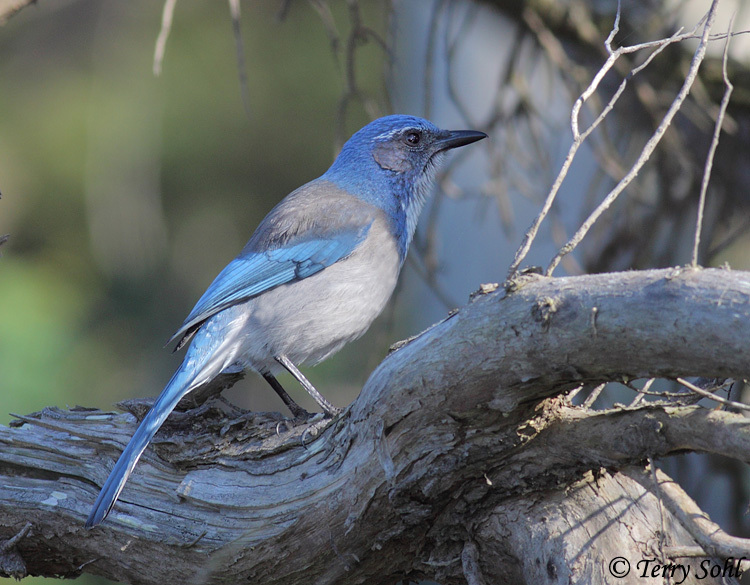 The Western Scrub-Jay is the most widespread of the Scrub-Jay species. 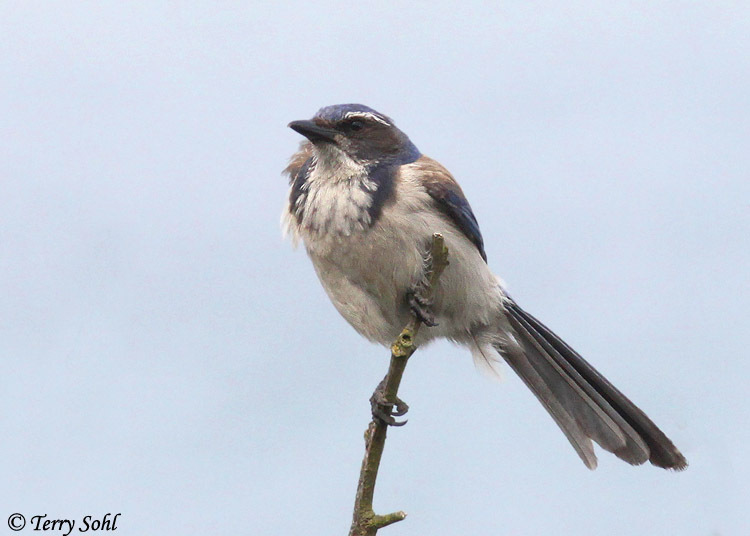 This species, along with the Island Scrub-Jay and the Florida Scrub-Jay, were all once considered a single species. They are a common sight and sound throughout much of the West, often seen conspicuously foraging in suburban landscapes, or heard when giving their variable harsh calls. 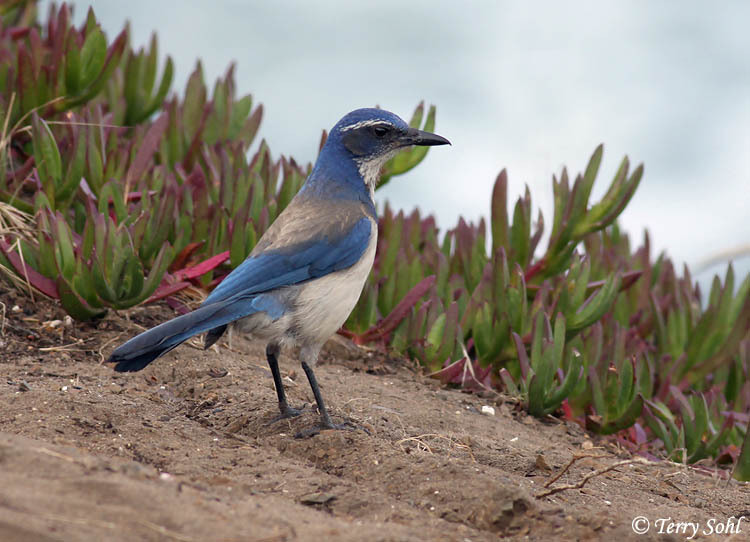 Habitat: Western Scrub-Jays can be found in a variety of shrubby and brushy habitats. 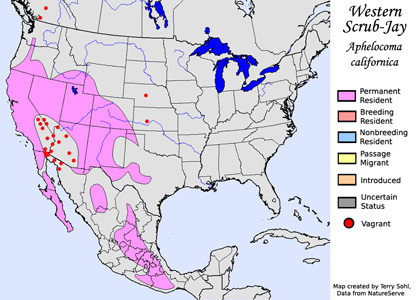 In areas near the coast, they typically live near oak woodlands and scrubby chapparal, while interior birds are often found in pinyon pine and juniper. Diet: Omnivorous, feeding a wide variety of plant and animal matter. 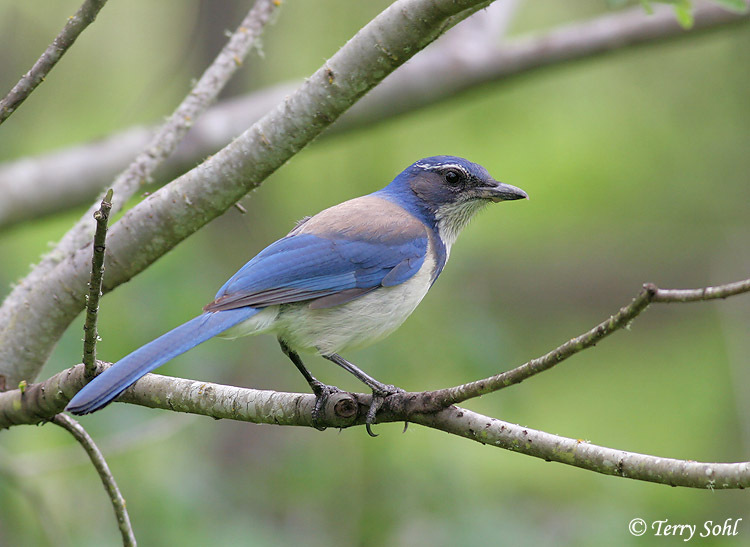 Western Scrub-Jays feed heavily on sects and spiders during the summer months, while the winter diet often consists of more plant material, including seeds, acorns, fruits, and berries. They will also take small reptiles, amphibians, young birds, eggs, and small rodents when the opportunity arises. 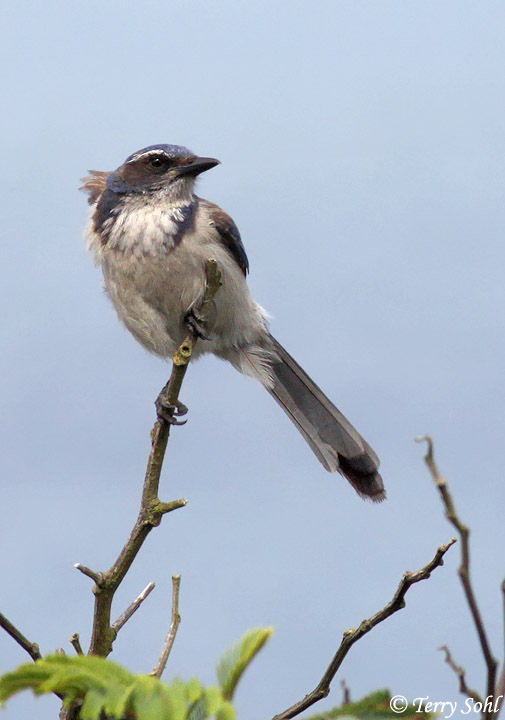 Behavior: During the breeding season, Western Scrub-Jays normally are found as isolated breeding pairs, and will vigorously defend territories from other Scrub-Jays. Outside of the breeding season, they are often found foraging in small family groups or small flocks. Mated pairs typically stay together throughout the year. Nesting: Both the male and female help build a cup-shaped nest of sticks, plant material, and moss, usually relatively low in a tree or shrub. The female incubates the eggs, with the male feeding her during incubation. Both species will help feed and tend to the young. Song: Utters a variety of rather harsh-sounding calls. 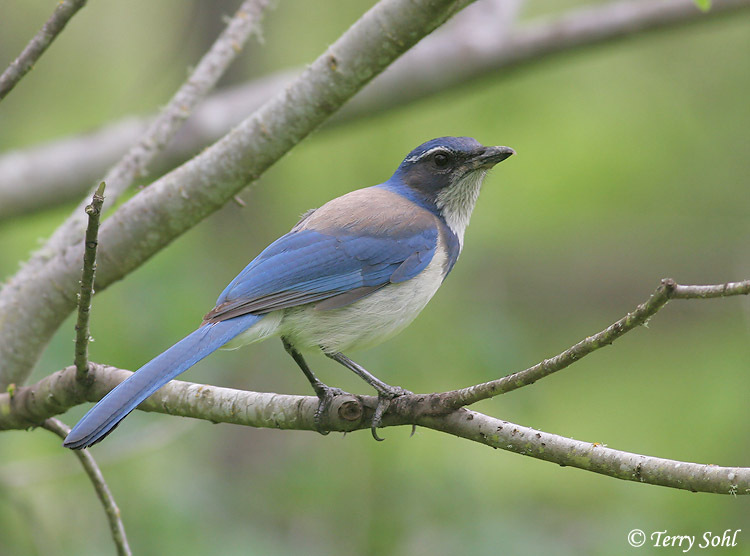 Migration: Considered permanent residents throughout their range, although there is some dispersal of birds in years of scarce food supplied in normal locations. Feeders: Will sometimes attend feeders for nuts and seeds. Can often be found in suburban areas, hunting for insects, as well as for fruits and berries in suburban landscaping. 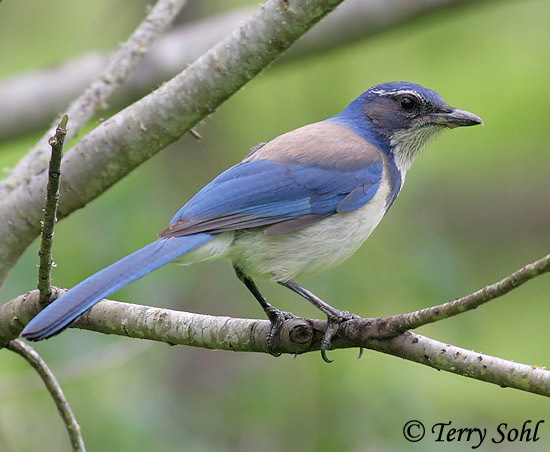 Similar Species: Closely related and similar to Island Scrub-Jay and Florida Scrub-Jay, all of which were once considered one species. 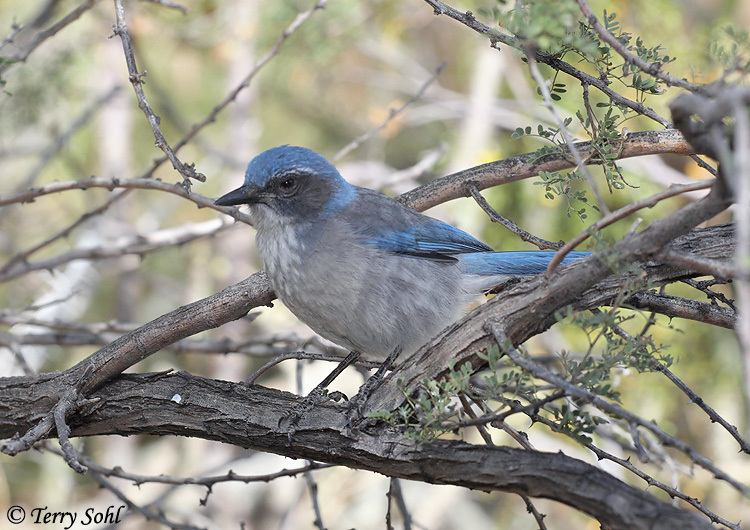 Also similar to Pinyon Jay and Mexican Jay. 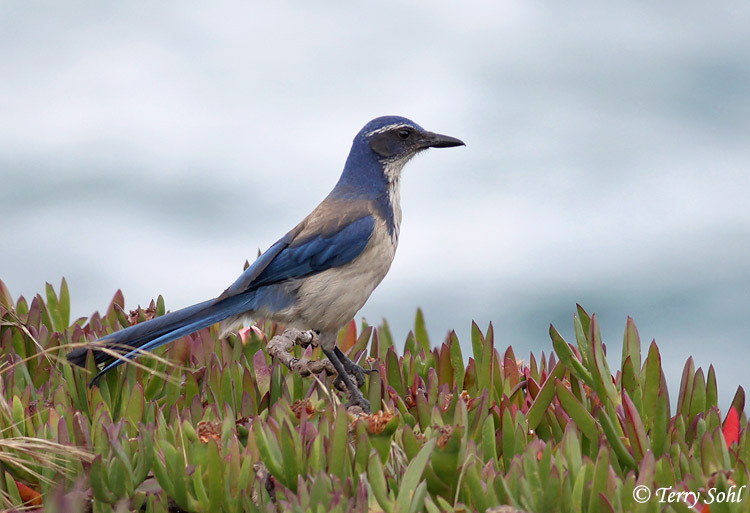 Conservation Status: There are currently no perceived major threats to Western Scrub-Jay populations, and Birdlife International cites it as a species of "Least Concern". Populations may be expanding northward and eastern in the last few decades.